Milo was named by the kids of Glenbervie school, when he stopped in for a visit on his release day in November 2016. He was caught on 27/10/16 on Whangarei’s kiwi creche – Matakohe-Limestone Island and had no transponder so is presumed to be island bred. 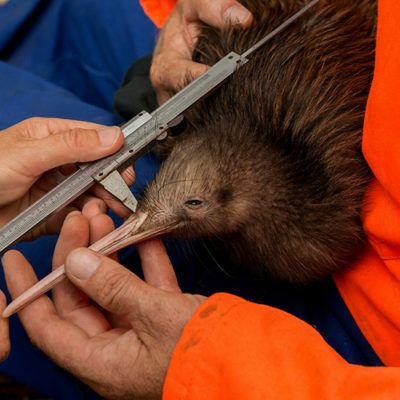 His parents would have come from the Department of Conservation Whangarei Kiwi Sanctuary out near Purua. Milo was less than a year old when released based on his weight and bill length. Since his release, Milo has been busy exploring his new home and has walked a considerable distance zig-zagging up and down the Tutukaka Coast. Read about where he’s been tracked wandering and check out the maps here. Where will Milo wander next…? Is he looking for a mate or a good spot to set up his own territory…? You can become a kiwi sponsor and follow Milo’s life and adventures by signing up to the Kiwi Coast ‘Follow a Kiwi’ Program. As a Follow the Kiwi Sponsor you will receive news, updates, photos and event invites FIRST!